Intimate walking tours that uncover Melbourne’s independent fashion designers. Our walking tours of Melbourne’s fashion precincts are the best way to find your personal style and to discover independent, beautifully-made and unique fashion and accessories — all made or designed in Melbourne. 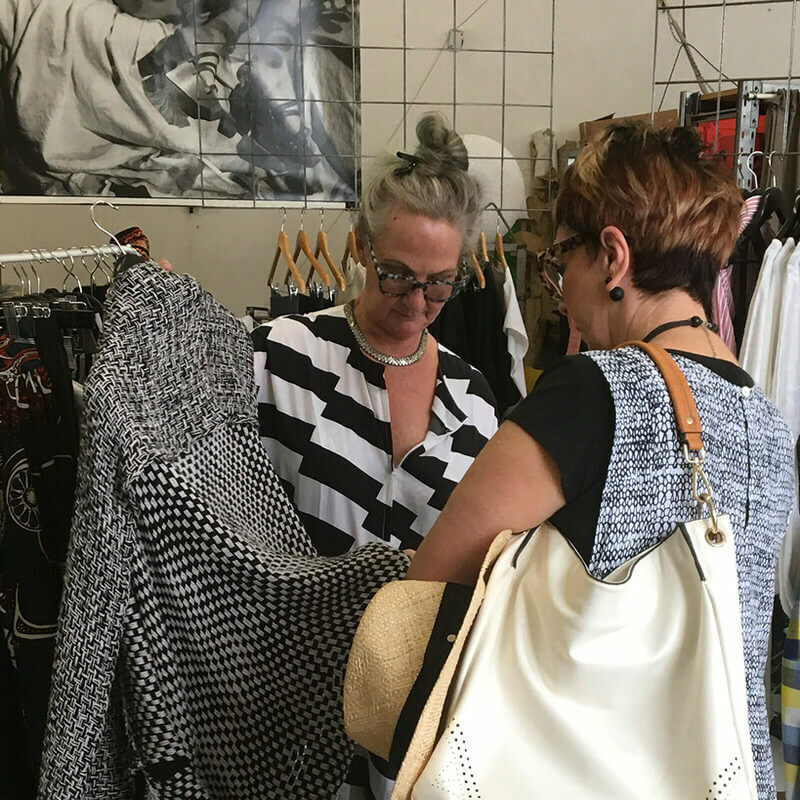 Learn while you walk with personal style specialists, Donna Cameron and Briar Jasper-Batson, who will teach you about shape, colour and fit as they take you to meet local independent fashion and accessory designers. No big crowds or big buses. Just small, intimate groups with a passion for (independent, ethical and sustainable) fashion. We have a city tour for men and another for women. Once the birthplace of Australian fashion, and formerly bustling with machinists, tailors, dressmakers and designers, Melbourne’s CBD has undergone a regeneration. Famous for its laneways of bars and cafes, we take you to meet contemporary fashion designers who - once again - are making Melbourne’s CBD a fashion destination. As Melbourne’s first suburb, Fitzroy’s reputation for being Melbourne’s cultural centre is firmly established with its colourful collision of cafes, galleries and studios (home to some of Melbourne’s finest artists and designers). Enjoy 19th-century architecture and cultural history as we walk through Fitzroy’s vibrant streets and visit its talented designers. No matter what you're celebrating, we’ll ensure you and your guests are treated to something special. We'll organise drinks and food to dazzle you, introduce you to independent designers and provide you all with some serious style advice. Add spice to your next conference or team building day with a Fashion by Foot tour - especially if your delegates are from out of town. Treat them to a day of shopping - you know they want to - we're famous for fashion here. Planning a day out with friends? You can book us all for yourselves! We'll tailor a tour that suits you all perfectly and will make sure that you and friends have an afternoon out together you’ll all remember for years to come.